In most languages, the word for the season where we celebrate the Resurrection of our Lord is related to the Hebrew word for Passover, i.e. Pasch. But in English, we have the peculiar Anglo Saxon word Easter, which is formed out of their word Oest (for rising). The reason is that the Anglo Saxons associated the Resurrection of our Lord with the rising sun in the east from where this new religion of Christianity came, just like the sun that rose daily to bring the world back to life. This may seem like a very naturalistic and almost pagan approach to religion to some folks so separated, as we are, from nature. 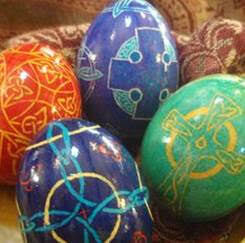 Yet the symbols for Easter themselves are very naturalistic. We await the sun to set before we begin the Easter Vigil. We start a Paschal Fire and bless the Easter water for baptism. We bless the new Paschal Candle, and we even thank the honeybees for making the wax. The altar is usually surrounded with spring flowers (a clear natural symbol of new birth). The recently blessed Holy Oils bring joy through the sacraments. But how do we affirm what is happening in the Church in our homes, our domestic churches? In our overly-commercialized world, we are often encouraged by the stores to purchase porcelain bunnies and eggs, or spring arrangements of flowers to decorate our homes. And yes, they are, in their way, natural, and they can have their charm, but they tend to make Easter more about spring than about the Resurrection. Nature is good, and it preaches to us about Christ, but we don’t worship bunnies. Moreover, as is the nature of commercialized holiday merchandise, they tend to have you skip Lent and hop into Easter without penance. The element of prayer and the sense of the Church’s calendar are missing. And Easter, friends, is a season of fifty days (not just one day), and our Church holds this season dear, so how might we better celebrate this season in our own prayer and in our own homes? Following are some ideas. Eat pretzels instead of desserts. Pretzels are a traditional Lenten food created by monks for their fast. The shape of the pretzel represents praying hands. Set up a prayer table with a crucifix, a saint’s statue (or two), and a candle; cover the table with a purple scarf or tablecloth, the color of repentance. You can place a vase with forsythia branches that should bloom in time for Easter. Light the candle each day when you say prayers together as a family. Consider learning a new prayer, like the Memorare or the Angelus. Make a spiritual bouquet of prayer petal flowers for elderly neighbors or shut ins – http://www.domestic-church.com/CONTENT.DCC/20000301/FRIDGE/rosary_bouquet.htm. Every Friday during Lent, pray the Stations of the Cross at the parish, or, if you are unable to get to church, pray them at home. Print a Stations of the Cross booklet for your children to color – Http://www.catholicmom.com/stations_booklet.pdf has a wonderful version. Take your blessed palms home from Mass on Palm Sunday and decorate the mantle or arrange them as a centerpiece on the dining room table. Dye some eggs for hiding or just for eating. In days gone by, you were not to eat eggs during Lent, so Easter morning naturally included eggs on the menu. As eggs don’t perish quickly, most farmers had collected quite a lot of them by the end of 40 days. You could also bake a cake with some of those eggs. 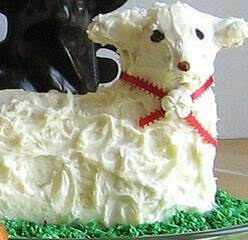 In Eastern Europe, there is the tradition of the lamb cake, too. Make a set of Resurrection Eggs; http://www.catholicicing.com/catholic-resurrection-eggs/ has directions, or you can buy a set. Use this to help teach the Passion story to your little ones. Try to come with your family to the church for the Triduum, the great liturgies of the Church. On Good Friday, make traditional Hot Cross buns (no icing!). Tradition has it that Father Rocliff from St. Alban’s Abbey (Catholic at the time) began distributing buns with a cross inscribed on the top to the poor on Good Fridayin 1361. The custom spread throughout England. On Holy Saturday, dress a statue of Mary in black for mourning, a wonderful Mexican tradition. Sewing a beautiful black gown for the Madonna to wear on this day might be a good family project. Don’t forget to add some religious items to your children’s Easter baskets like a saint statue or video. For younger children consider purchasing the DVD, Best of Little Children, which teaches the Rosary, the Divine Mercy, the Angelus, the guardian Angel Prayer, the Memorare and more. For older children, consider giving a book. The Book of Saints and Heroes by Andrew Lang contains some familiar and less well-known saints. Easter Sunday: Most families have their own family traditions for Easter day, which are usually centered around church and a family meal. Some families have the tradition of their own personal Easter candles (or Lumen Christi) that they put on their home altar shrine or in the center of their table and light every time the family gathers for prayers or a shared meal. Bringing the candle to church with them on Easter, they ask the parish priest or deacon to bless it, they then take it home as a reminder of that Easter joy. Placed in a bowl of fresh cut flowers, it might become the centerpiece of their spring table. Like the tall white candle we light during the season here at our parish church when we gather around the sacred altar, a Catholic family might similarly demonstrate to their own children the joy of the season in their domestic church by a similar sacramental. And on Pentecost, they leave whatever is left of the candle to burn out, and close the season. Easter Week: Pray the Divine Mercy chaplet together with the family every day leading up to Divine Mercy Sunday. What is this mystery, so great and new? Wow, if our kids knew that by heart at the end of Easter season, they would have learned something awesome! Claim back Handel’s Messiah for Easter, as this was traditionally an Easter piece, not a Christmas piece. For young children, read some beautiful Easter books during the season like Petook by Caryll Houselander, A Tale for Easterby Tasha Tudor, and Simon and the Easter Miracle: A Traditional Tale for Easter by Mary Joslin.